An enrichment of history and a direct reference to the glory days of an influential era. This workshop concentrates on Detached Buttonhole Stitch - used prominently in Elizabethan costume - but to make of a modern version of a chatelaine. 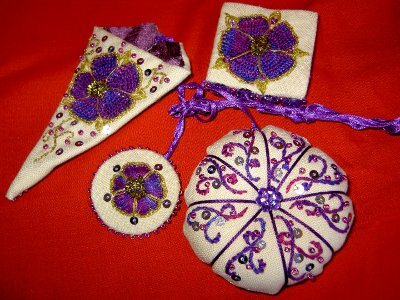 The main technique for this workshop is to use Detached Buttonhole Stitch to fill the petal shapes of the Tudor Rose. This stitch formed the main part of the elaborate shapes found in costumes of the first Elizabethan era, which were highly decorated, and had gold thread and spangles (sequins) applied, making them very colourful. A modern version of a Chatelaine is what has inspired the designs for this workshop.